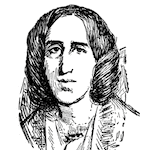 Mary Anne Evans, better known by her pen name George Eliot, was an English novelist. She was one of the leading writers of the Victorian era. Her novels, largely set in provincial England, are well known for their realism and psychological insight. Silas Marner, published in 1861, is a dramatic novel following the life of Silas Marner and his path from embittered outsider to proud father and respected citizen. FCIT. "George Eliot author page." Lit2Go ETC. Web. 20 April 2019. <https://etc.usf.edu/lit2go/authors/174/george-eliot/>. FCIT, "George Eliot author page." Accessed April 20, 2019. https://etc.usf.edu/lit2go/authors/174/george-eliot/.